It’s been quite a spring for birding on Long Lake. This male Baltimore Oriole and his mostly yellow partner have been eating us out of house and orange. We think it’s only one pair. And for the last four days they’ve been eating an orange a day. The female seems to prefer this birch tree feeder. The male comes closer to the house and eats the half-orange we hung on a maple tree. We’ve tried to tempt with oranges in the past, basically without success. But this pair is bringing us tons of colorful pleasure in exchange for a good dose of vitamin C.
The male tries to feed at the hummingbird feeder every once in awhile, without much success. His song is described on Cornell’s site as “flutelike” with a “full, rich tone,” consisting of “a short series of paired notes, repeated 2–7 times, lasting 1–2 seconds.” Yep. And I will add that it seems to get more insistent and irritated when the orange halves are depleted. Earlier in the spring, Steve got this great shot of a Purple Finch, feeding on a sunflower seed. And, of course, that’s a Chickadee off to the left. We see Goldfinches by the boatload. But Purple Finches? Not so many. They seem slightly bigger and more solidly built than the Goldfinches. They are red, not purple, though. 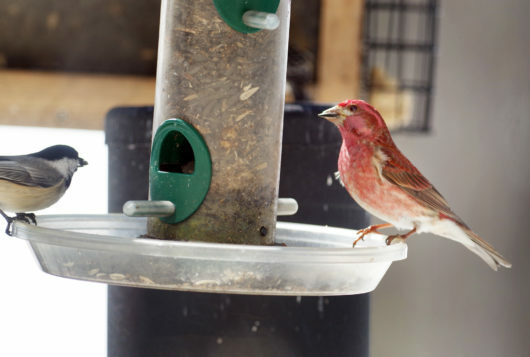 This article gives solid information to help distinguish a Purple Finch from a House Finch. We’re pretty confident this is a Purple. Purple Finches aren’t rare in Michigan. Neither are Spotted Sandpipers. But we don’t often see either bird. 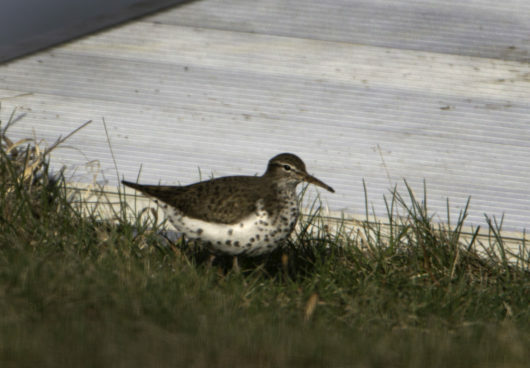 This Spotted Sandpiper was bobbing around foraging in the grass near our dock, and eating, for about 20 minutes. This bird’s nicknames include teeter-peep, teeter-bob, teeter-snipe, and tip-tail. The first time you see their comical bobbing and scooting, the nicknames make every bit of sense. 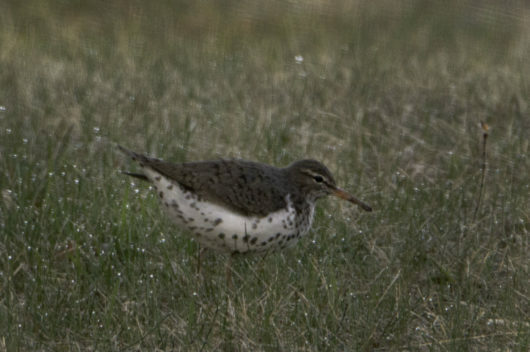 The male Spotted Sandpiper incubates the eggs and takes care of the young. The female? She’s busy in a different way. In any breeding season she may mate with up to four males and lay four separate clutches of eggs for her male partners to tend. Breeding adults have dark spots on their bellies. This breeding plumage molts away as summer progresses. Pretty bird, in a subdued way. 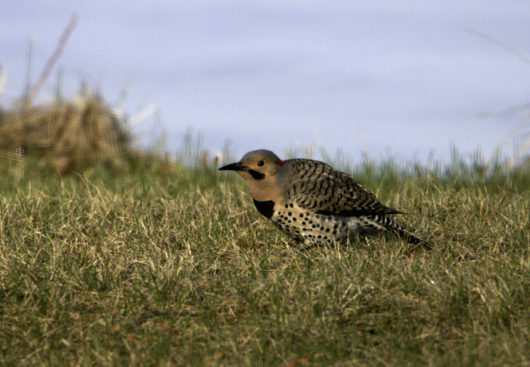 The Northern Flicker, by contrast, is not subdued. Flickers look like they were sewn together out of parts of several birds. Sort of a Frankenbird. Red (at the back of the head). A Black whisker. A Black bib. Orange cast to his head. Spots. Stripes. Yellow on his tail and flight feathers. Plus there’s a white rump patch. It almost easier to list what colors a Flicker isn’t. 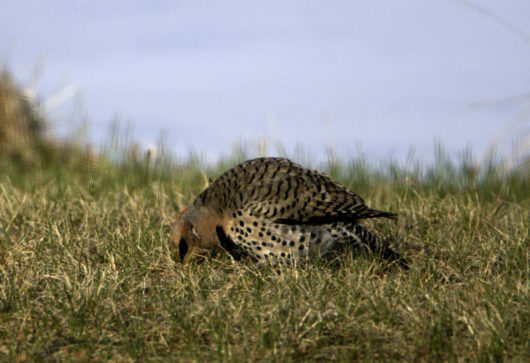 Flickers spend a lot of time feeding on the ground. And when they fly, like most other woodpeckers, they fly in a deep arc. This Flicker almost buried his long beak up to his eyeballs in search of tasty bugs. For the first time this year, we’ve seen White-Crowned Sparrows. As with the rest of the birds featured in this post, they aren’t rare. But we’ve not identified them before. Since they are such a distinctive bird, we’ve convinced ourselves that they are new to our neck of the woods rather than that our powers of perception have improved. That black-and-white striped helmet on his head is hard to miss. This sparrow spends a lot of time feeding on the ground. 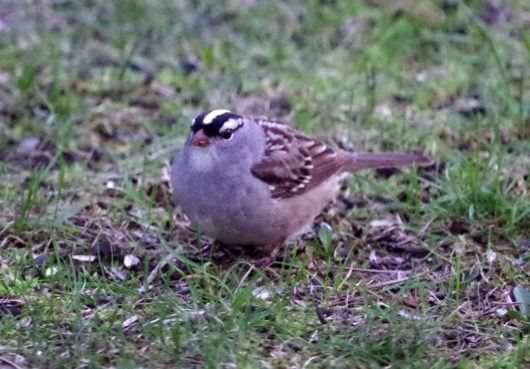 If “our” White-Crowned Sparrows are any indication, they also spend quite a bit of time mixing it up with one another. Over and over again a pair (or three) rise up a few feet from the ground and, wings fluttering, they go after one another. Whether this is aggression, courtship, or just a bird without a sunny disposition, we don’t know. 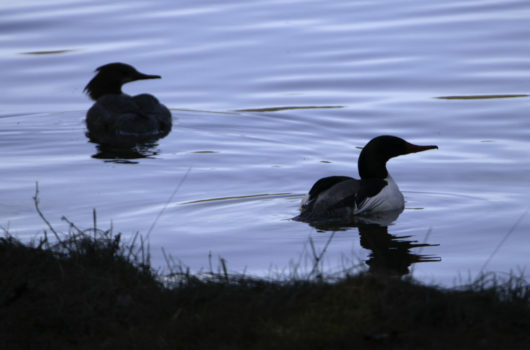 Common Mergansers are only on Long Lake for a few weeks each spring and fall as they pass through on their migrations. Here’s a pair, in the shadows near our shore. The male was looking spectacular. Green head. Red beak, Mostly white (with black) body. The female? 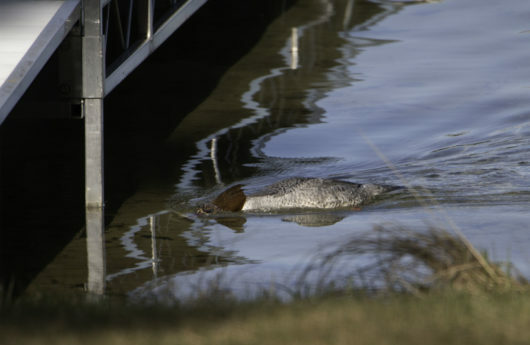 She’s got a white and gray speckled body and a red hairdo. They don’t look like a pair that would go together. Here’s Ms. Hairdo, peering near the shore and heading under our dock. Moving now from one kind of spectacular to…a very different kind of spectacular. A major bunch of Turkey Vultures. They (along with about 10 others) congregated behind our neighbor’s pole barn this week. They weren’t on a kill. They were just socializing. 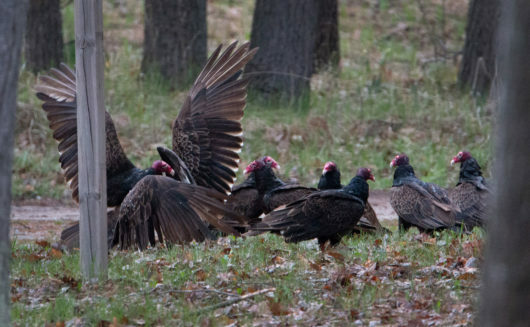 Maybe they were planning how they’ll do their face makeup for the upcoming Vulture prom. I admit this gathering creeps me out some. It makes me think I should lose weight, exercise more, and get healthier. Our industrious state bird, the American Robin–yep, the bird who LEAVES Michigan every year as the weather gets cold–is busy nest-building in a lower branch of one of our tall White Pines. 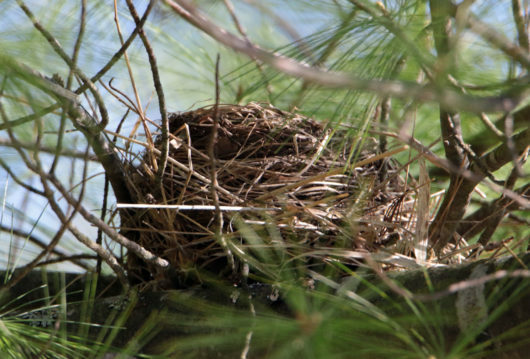 Female Robins build the nest. The last few days we’ve been watching her working on it, flying back and forth with long grasses in her bill. She builds the nest from the inside out. First, she presses grasses into a cup shape, using the wrist of a wing. Then she gathers worm-castings to line the nest with mud. HGTV house hunters probably wouldn’t approve. Worm-castings gray probably isn’t quite the “in” shade. 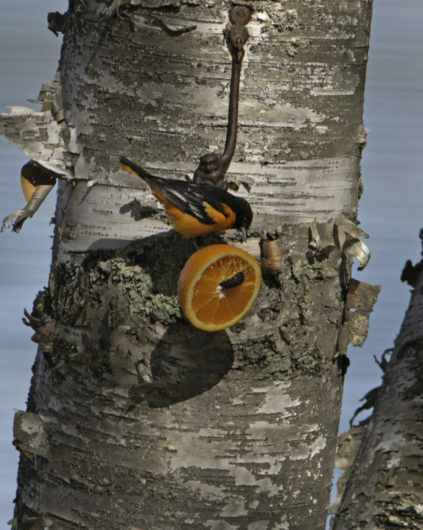 This entry was posted in Long Lake creatures, Michigan's "Up North" and tagged Baltimore Oriole, common merganser, Northern Flicker, Photos by Steve Thorpe, purple finch, Robin's nest, Spotted Sandpiper, Turkey vulture, White-Crowned Sparrow by Noreen. Bookmark the permalink. All very interesting and as always, amazing photography! @marty…thanks much for visiting my blog and your comment. Those sparrows REALLY go after one another–which is another reason why Steve and I are pretty sure they are a new arrival at the lake.